In 1971 a member of the newly formed Irish Dancing Association ‘An Comgall’, invited individual Irish Dancing Teachers (who competed at local Musical Festivals), to a meeting in the International Hotel in Belfast, - the aim was to amalgamate. Teachers at that meeting were advised to form an Association and as a result, a meeting was held in Ballyclare and the ‘Nine Glens Association’ was formed in Autumn 1971. 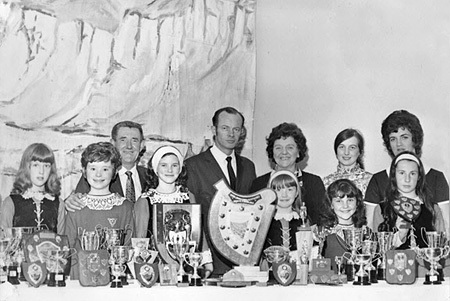 The Nine Glens Festival of Irish Dancing at Glenravel Parochial Hall, Prize-Winners in the Reel and Slip Jig on Wednesday, seen with the adjudicator, Mr. D. McLaughlin, chairman of the Association, Mr. Patrick Mulrane and Mrs. M. Gardner, Secretary of Festival Dance Teacher Association, Mrs. Sadie Higgins, committee member for Nine Glens and Mrs. June McCalmont committee member of Glens. The dancers from left - Catherine Hill, Joan Wasson, Camilla Hamill, Geraldine Black, Amanda Morgan and Roisin Connon. Three Festivals were held in 1972. Ballymena in the Spring, Glenravel from 28th June -1st July and Carrickfergus at Halloween. Some years later the ‘County Antrim Championships’ were held. Subsequently, due to an increase in membership, in 1986/87 the event became known as ‘The Ulster Championships’ and from 2002 the ‘Nine Glens Association’ was renamed the Festival Dance Teachers Association. 2013 – The present FDTA members owe a great debt of gratitude to these founder members and we are eternally grateful for their courage in taking a very brave step to form a new association. WE are always mindful of the courage this took and endeavour to build upon the foundations that have been laid down by our predecessors. It is the ethos of the FDTA to promote, foster and nurture the beautiful art form known as ‘Festival Dancing’. We thrive in the knowledge that we have a unique style and technique and it is this quality that we strive to protect and equally develop as dance progresses. It is hoped that the FDTA will go from strength to strength and that in the future our present day dancer’s will take the place of their teacher’s and carry on our unique style and tradition of Festival Dancing.